Ghana’s Black Maidens suffered a heartbreaking exit at the ongoing FIFA U-17 Women’s World Cup after a penalty shootout loss to Mexico despite taking the lead twice in regulation time. The Maidens, who enjoyed a stellar group stage performance, scoring 10 goals in three games, were looking to better their 3rd place record they set back in the 2012 edition in Azerbaijan but that wasn’t to be. Mexico were able to find more of a passing rhythm in the first half and their defence, led by Nicole Soto and Tanna Carreto, limited tournament top scorer Mukarama Abdulai to one half-chance. Neither side was able to create a clear goalscoring opportunity in the first half. That all changed almost immediately once referee Maria Carvajal blew the second half whistle. 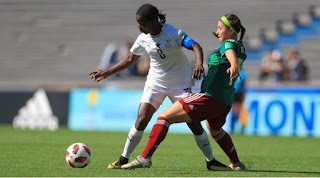 Ghana winger Mavis Owusu created space on the right wing, before sending in a cross for Abdulai who guided a textbook header inside the far corner from about ten yards out, just out of the grasp of a leaping Jaidy Gutierrez, for her seventh goal at Uruguay 2018. It was then a case of déjà vu as Perez equalised again, this time in more spectacular fashion. From about 30 yards out, Perez drove a free-kick over the Ghana wall and beyond the reach of Ghana keeper Grace Buoadu. Mexico’s Gutierrez saved spot-kicks from Justice Tweneboaa and Elizabeth Oppong to lead El Tri to an historic victory.